The ability to run split tests changed online marketing forever. If you want to compare two different versions of a website or landing page against each other and see which one does a better job of converting visitors into customers or users into leads, you need to know the basics first. In this guide you will find all you need to know about split testing and how to run seamless campaigns yourself. Split testing is a solution for carrying out A/B tests. By comparing several versions of your web pages, such as your landing pages or homepages, a split test helps you identify which one has a better conversion rate for your visitors. When the split test is launched, your pages’ traffic is randomly spread over the different versions of your pages. Each one’s performance is tracked and analyzed by the split testing software to identify the version that converts the best, with the highest significance. Split testing determines the version on which the sample converted the best. Contrary to A/B testing, which works directly from our AB Tasty software, split url testing hosts the different versions on distinct URLs. Split testing therefore requires intervention from your technical team. And where A/B testing uses changes that are close to the original, split testing is used where the new version’s page design and content are significantly different from the original. Split testing is very useful in making major design changes in your website. For example, if you’re thinking about completely changing your home page’s design, split testing is the ideal tool to help you optimize conversions. But in testing a radically different version of your website, you will obviously make fundamental changes that require back-end operations that your marketing teams cannot make. Split testing, which requires technical teams to intervene, remains the best testing solution when changes are made on the back-end. A/B, Split or Multivariate Test: How to Choose the Right One? Why should I run split tests on my website? To understand why your visitors aren’t converting, it is important to ask yourself which content is keeping your visitors from converting. Your intuition isn’t enough; what matters is the product’s effect on your visitors. By performing a split test, you put your visitors at the heart of your decision-making process. On the one hand, the results obtained from split testing will help you know which page version they interact with the most, and, on the other hand, which information and design transforms them into repeat customers. Split tests promise qualitative feedback on user experience to help you identify barriers and optimise your conversion tunnel. (How to Use Qualitative Data to Plan your Next A/B Test). It’s perfect for low-traffic sites. One the one hand, if your website has low traffic, split url testing is simply the only method you can use (other testing scenarios like multivariate testing require a certain amount of daily traffic). On the other hand, it makes the analysis of results more than easy. Simply create two variations of a website or landing page and split the traffic accordingly. Afterwards, see which one generated more conversions. More money. Let’s put it like it is: After all, split testing will help you find the best version of your website possible. The better your conversion rates are optimized, the higher your average order value and the the higher your turnover will be. Data Insights: Session recording, heatmaps and NPS scores to understand the customer journey. Split testing & MVT: Easy-to-use visual editor to create experiments quickly. Marketing Campaigns: Expandable template library to get back in control of your website. Personalized Experiences: Advanced personalization capabilities to reach the right audience. Plus it’s easy to use. AB Tasty has designed a WYSIWYG visual editor that allows you to make simple changes by drag & drop and just a few clicks. No matter the goal, before you create a testing campaign, you have to know what you can test and which testing scenarios are ideal for split tests. In general, we suggest split tests whenever there are major changes being made on a site. Split test will guarantee you a better performance and less code to implement, because you can build a new page in your CMS. No additional scripts necessary. Especially useful for pages where you are testing drastic changes - like a complete overhaul of your existing homepage, product detail page or different landing pages. In general, short-form copy is said to be better than never ending paragraphs. First impressions are made within seconds. However, you will never fully know until you run a split test on your website or landing page yourself. In the end it’s all about data driven decisions here, right? Page copy is not just where you explain a product or a service. Page copy is also call-to-actions, client testimonials and much more. Finding the perfect position is crucial. The most common rule-of-thumb is the “above the fold rule”, which suggests you put the most important information on the top of your page. It works for most websites, but that doesn’t guarantee it will work for your individual business goals, too. Again: Put it to the test and let split testing decide. When you are testing completely different funnel processes or sign up workflows against each other, again, make sure you use a split test. This will require less code to be implemented on a single page and will improve the overall performance while running those tests. Data, data, data! A strong split testing campaign starts your website data. 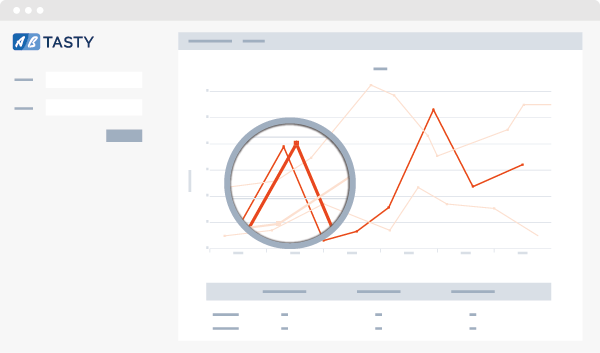 Use a website analytics tool and find weak spots in your conversion funnel, bounces as well as your top landing pages. This will help you determine the right approach and prioritize testing ideas. A split test should never be based on a personal opinion or feeling. For your split url testing campaign, make an assumption on which to base the test so that in the end you will know why you are seeing the results you are seeing. A strong testing hypothesis also describes a specific goal. Now it’s up to you to create a variation and split test it against the original page. In order to find out which one is more effective, use your insights from step 1 as a baseline for measuring your results. To calculate the best test duration, use our ab test calculator here. Which variation of your website delivered the highest conversion rate? Advanced split testing tools like AB Tasty will offer baysian a/b testing that helps you weigh up each variant’s impact on the conversion rate. With a strong testing hypothesis, there will be a clear winner. If there isn’t and the results turn out to be inconclusive, we suggest you go back to step 2 and rethink your hypotheses or have our conversion experts help you out with some advice.